Can foliar diseases in forage grasses cause economic losses for livestock producers? Most garden enthusiasts are familiar with fungal diseases in fruit and vegetable crops. These diseases can induce a range of experiences from mild gardener irritation to complete crop loss. Late blight in tomatoes, powdery mildew in squash, leaf spot, phytophthora , and pythium, just to name a few. The most frustrating diseases are those that spoil the quality of the product just before it is ready to harvest! Spores for most plant pathogens can be found almost everywhere those plants grow! Given the right conditions, they can devastate a crop. While some species and varieties of plants have varying degrees of resistance to certain pathogens, no plant is entirely immune. Fungal infection of fruit and vegetables can render a crop completely unmarketable, a fact that looms large in the minds of producers. In field crops and forages, however, fungal pathogens often do not prevent harvest or marketing, but often compromise yield and quality in ways that are not immediately evident. Until recently I had the impression that foliar disease on forages was not a ranking concern among livestock farmers or hay producers. This is why I was very surprised when I recently heard a farmer state that mid-summer grass diseases (foliar) are the most significant agronomic problem on his farm! While some species and varieties are resistant to some fungal pathogens, all grasses and legumes are susceptible to some diseases. For example, there are at least 30 fungal diseases that can affect orchardgrass. Depending on the time of year, the primary ones we see are rusts (caused by species of Puccinia fungi), scald (species of Rhynchosporium), and leafspot/blotch (species of Drechslera). All of these diseases are favored by prolonged periods of leaf wetness. What are fungal pathogens really after? the plant has been stressed by drought, nutrient deficiency, insect damage, another disease, or lack of sunshine. Potassium deficiency is often connected with increased susceptibility to foliar disease. the leaves of the plant are wet for prolonged periods of time. This time of year the dew sets early, nights are getting longer, and the grass is wet late into the morning. Heavy forage stands reduce air movement, which causes the leaves lower in the canopy to stay wet longer. Prolonged leaf wetness allows pathogens more time per day to penetrate plant defenses. there is a lot of inoculum around. In perennial forage stands, there is a lot of inoculum (spores) around in the soil and decaying plant material. the plants are over-mature. Plants will prioritize sending mobile nutrients to parts of the plant that have more access to sunlight. Lack of photosynthesis deeper in the canopy and self-induced nutrient deficiencies accompany senescence (death) of lower leaves. As this happens, these leaves are often colonized by plant pathogens. Is foliar disease really an economic problem for farmers in the Northeast? Leafspot (drechslera spp.). Picture by Daniel Hudson, University of Vermont Extension. Fungi are after the total nonstructural carbohydrates (TNC) in the plant. In affected tissue, much of the TNC and proteins that are not consumed by the fungi will be consumed by opportunistic microbes. 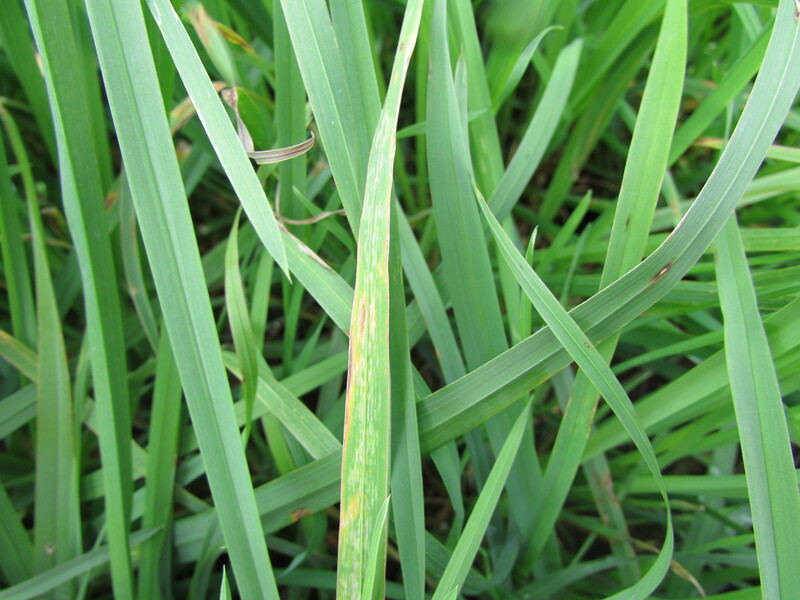 USDA laboratory research published in 1978 found that orchardgrass plants that had been inoculated with the pathogen that causes stem rust had TNC levels that were 36% lower than uninoculated plants. The report also suggested that the nonstructural carbohydrates from infected areas of the leaf are essentially gone. Other research shows that fiber digestibility below fungal uredia (the visible spore-producing areas on the leaf) are not digested in the rumen. Higher fiber levels: losing nonstructural carbohydrates increases the proportion of fiber in the harvested product. Because ruminant feed intake is determined (limited) by fiber levels, livestock can eat fewer pounds of that higher-fiber product per day. Refused pasture: this is what most graziers notice. It is not uncommon for animals to refuse a large percentage of grass tissue in a pasture when it is diseased. Reduced NSCs change the taste and smell of the forage, and there may be a bad taste besides associated with the spores or byproducts of microbial metabolism. Sorting hay: livestock will often sort or reduce intake of dry hay that had foliar disease prior to harvest. Have you ever noticed many tan/brown blades of grass in an otherwise green bale of second cut hay? They are likely the result of foliar disease. Plants that are weakened by disease this year are more likely to be winter-killed or injured, which will reduce forage yield next year. A cow with low body condition score. Picture from Virginia Tech. These problems are economically harmful to livestock producers. Forage in the pasture that is rejected by the cows will not help the calves grow or the cows lactate. Refused pasture forage translates to fewer animal grazing days per acre. Dry hay that your livestock sort out rather than swallowing is a direct economic loss. Hay or haylage with significant foliar disease prior to harvest will have lower NSC and higher fiber levels, which reduces intake and performance. The only way to completely compensate for this is by feeding more grain. If a farmer chooses not to compensate for the lower forage quality, animal performance will be compromised: slower growth, lower levels of lactation, and/or loss of body condition. If this is such a problem, why is it almost never discussed? We are not collectively more aware of the costs associated with foliar diseases in forages because the the crops and livestock do not die outright, there is no bad smell associated with it, and it is not as visibly dramatic as many agronomic problems. We are frustrated with poor performance, refused pasture, and the costs of supplementation, but often do not acknowledge the role that foliar disease can play in the process. How can foliar disease problems be reduced in my forages? Spreading poultry manure on pasture. Picture from University of Georgia. Address soil fertility problems. 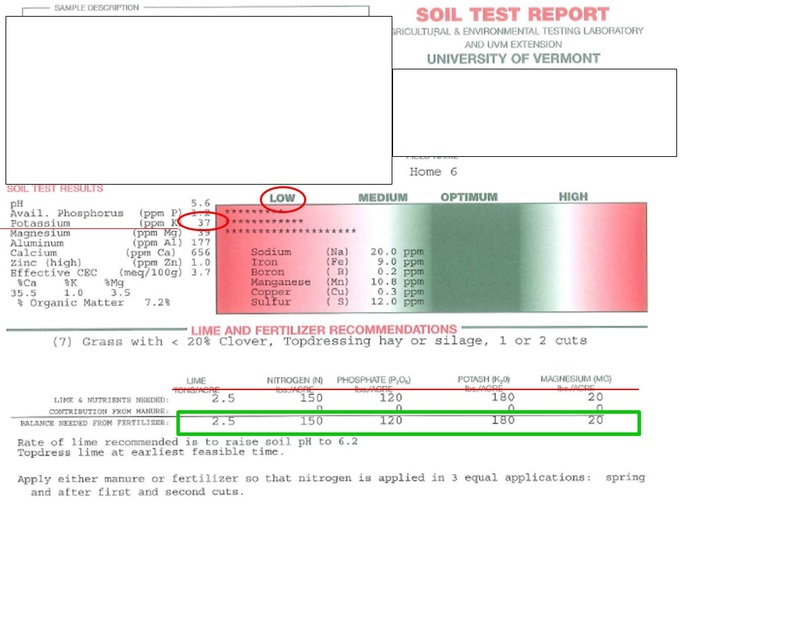 Soil test reports will reveal if you have nutrient deficiencies. Alleviating potassium deficiencies in particular will make plants less susceptible to fungal attack. Keep in mind that the first cutting removes the vast majority of the potassium for the season. If potassium levels are marginal in the spring, they will likely be critically low for subsequent cuttings that year and that can make disease problems worse in mid- to late-summer. Consider whether shortening your harvest interval might be appropriate, especially in conditions that favor the development of disease. If you compare regrowth from a recently harvested hay field with a more mature regrowth, you will notice that older leaf tissue is more susceptible to infection by some of the most significant pathogens. Timely harvest will often improve quality and remove potential inoculum. While it may not be practical in many cases, crop rotation can reduce the amount of inoculum in the soil for a short period of time. Learn to identify which diseases are plaguing your forages. When you are reseeding, seek out plant varieties that are resistant to those diseases. Seed companies usually indicate what diseases their varieties have resistance against. Some university variety trials also rate disease resistance. Alfalfa and clover do not share many diseases with grass. 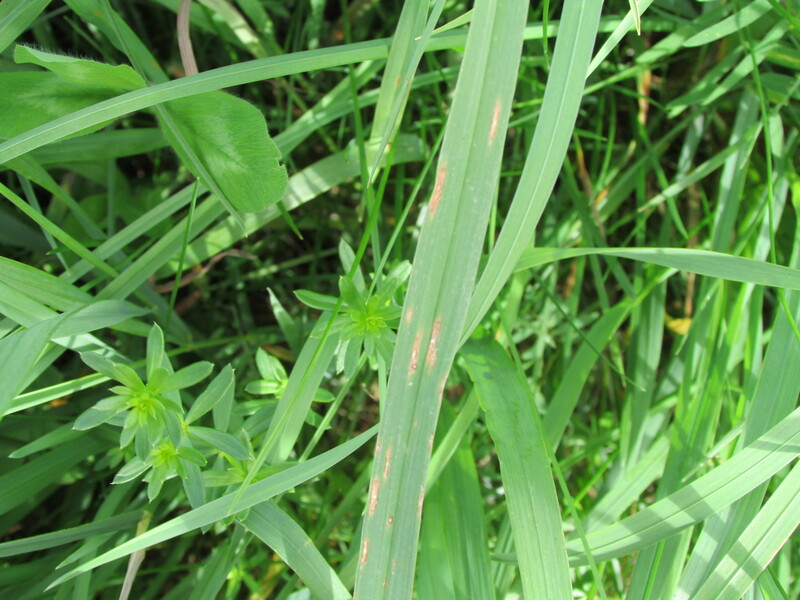 While it will not entirely stop the spread of disease in the stand, inclusion of these and other legumes in your pasture and hay fields may reduce the spread of inoculum by providing a physical impediment against the spread of spores from one grass plant to another. In pastures, graze the regrowth when it is ready – not after you have finally caught up with the part of the pasture that initially got away from you earlier in the grazing season. Allowing the plants to get too large increases the likelihood of fungal infection. If you are ever trying to decide whether to take that last cutting that looks ‘almost big enough to harvest’, keep in mind that grass thatch from an unharvested hay field will be a source of inoculum the next year. This fact alone is not enough to justify harvesting marginal-yield last cutting, but it is a factor that should be considered. If you notice that foliar disease is a problem for a particular species on certain soil types, think about what might be causing that plant to be stressed and whether you should plant different species on those soils. This entry was posted in Uncategorized and tagged carbohydrates, Drechslera, fertility, fungal disease, fungus, grain, grass, hay, haylage, leafspot, losses, palatability, potassium, resistance, resistant varieties, rhynchosporium, rust, scald, soil fertility, yield. Bookmark the permalink.